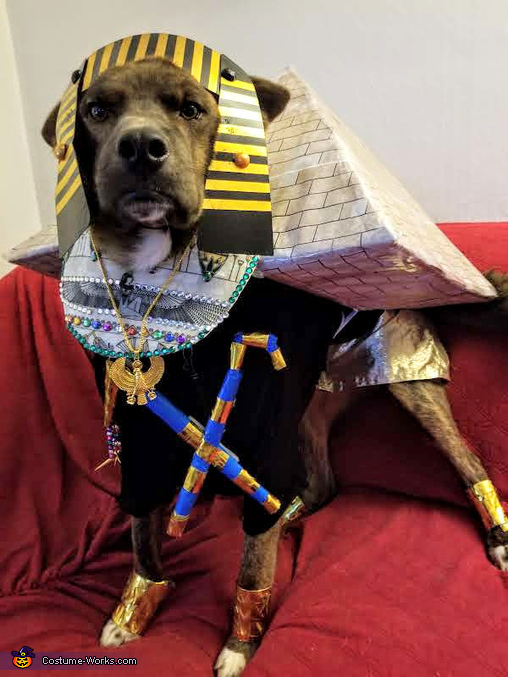 Krono, my 3 year old Dutch Shepard, who loves dressing up, actually I think he loves the attention. The basic dress is one of my old t-shirts. I use cardboard covered in colored duct tape to make the Crook and Flail. The neck piece is also a cardboard base covered in fabric and the bejeweled. Cardboard is also the base of the Pyramid then covered with printed brick pattern and applied like wallpaper and padded with fur when it sits on his back held on with elastic and velcro. The skirt is an old golden table runner just gathered and attached to the shirt. The leg cuffs are also cardboard covered in gold duct tape. The whole costume cost under $20 but was time consuming to make with all the detail. I usually start in August as I also make costume for myself, I am Cleopatra...it is a fun time of year for both of us!